LAKE FRONT FIVE STAR VILLA PERFECT FOR FAMILIES OR COUPLES this is perfect home! NEAR THE BEACH AND THIRD AND FIFTH AVENUE SHOPS AND FINE DINGING. 10 minutes away! Our fabulous family home lies overlooking a picturesque lake. It is beautifully decorated & furnished. The South West facing screened heated pool (size 24 by 14) for the sun worshiper with a spa that has seating for 8 is ideal for early evening cocktails to watch the sunset. There is a shaded patio area outside the lounge doors that can be used for alfresco dining with seating for 6, also a bar area for sun downer drinks next to the spa overlooking the lake. We have poolside landscape lighting to watch the pelicans feeding on the lake. Plus ceiling fans under the lanai, the pool and Spa have night lighting. Our private gated community provides communal pool, clubhouse, play area, is situated 3 miles (10 minutes drive) from the Gulf beaches and elegant shops and restaurants of Olde Naples. This villa is very near the beach. The other 3 bedrooms also have their own TV. Further Details : Elegant Naples is a shoppers paradise with numerous designer shops and elegant boutiques The Village in Venetian Bay and Pelican Bay thro to Third Street South all pedestrian friendly. Naples has 10 miles of sugar sand beaches with dazzling sunsets, There is also boating, crusing and fishing from Olde Naples Pier. Dining in Naples ranges from Gourmet to Al Fresco or family dining too numerous to mention. Marco, Captive and Sanibel Islands are easily assessable also the Everglades The Keys, Fort Myers, and Sarasota. Orlando (Disney Resorts) is two and half hours drive away.Publix and other local shops are 10 minutes drive from the gate. Fly to Fort Myers: Fort Myers Airport is approximately 35 miles from our villa and this is an easy drive down 175. The airport provides a warm and relaxed welcome to South West Florida. Miami Airport is approximately one and half hours drive away and Orland Airport is about four hours drive away. I have put my own touches to Flamingo Palms villa, we fell in love with Naples on a family holiday and felt it had everything you could want and need for a great family Vacation, we come back twice each year to maintain our villa's and keep them up to a very high standard. Please read all our honest reviews to make your own decision to stay in our lovely home. You will not be disappointed! It is the only villa on this lake with outside landscape lighting !!! making outside dining a pleasure. A real 'Home from Home'! We bought this plot especially for the lake view, and designed Flamingo Palms around the sunrise and sunset! it has a party feel to the villa with the landscape lighting and outside pool and hot tub we know all our guests leave wanting to return again, and they do return again year after year! The unique benefits of this villa is the large span of sliding doors leading onto the pool area, ideal for couples or large parties, entertaining and having fun in the sun or sunset. There is also a fourth bedroom unit that is ideal for mixed age families to have some special time and their own space. We are located just a 10 minute drive from the beaches and the famous Naples Pier. Just a short 10 minutes drive to the beautiful Naples beaches and Pier. Our villa is built lakeside, with a great 75 degree view of one of the biggest lakes on Briarwood! We just returned from spending a month at Flamingo Palms, it was wonderful. 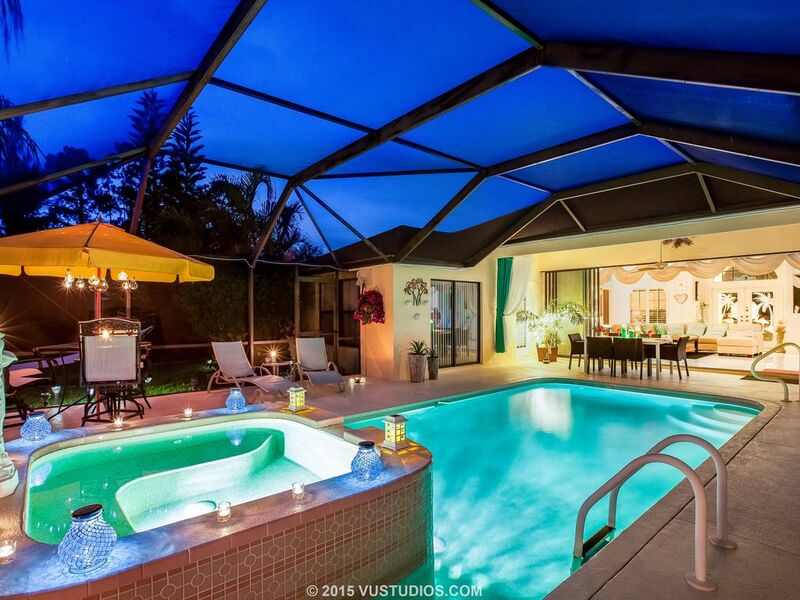 A beautifully decorated home with everything you need including a Lanai with pool and spa. Located at the end of a quiet court, a southwest exposure overlooking a small lake, drenching you with all day sun and providing you with picture worthy sunsets, whats not to like! Beaches, shopping, great restaurants are only 10-15 minutes away. Briarwood is a safe, well kept, gated community that we never tired walking around. The owners Eileen and Geoff were always available by e-mail, and were very quick to respond to any situations that arose. That makes a huge difference in a rental property. We hope to be back sooner than later!!! Thank you Steve and Cinzia for taking the time to write this review. We loved having you both rent our house. Thanks so much for the well thought review. You must be one of the most 'perfect couples' any homeowner could wish for, you left our home clean and tidy and we are so pleased that you enjoyed the whole Briarwood and Naples experience,. we appreciate having you stay with us. I don't believe anyone looked at the house before we arrived. Florida is full of insects but there should not be dead bugs on the floor when you arrive. House and furniture need a good cleaning. Appliances are rusted and found a dirty greasy pan in the oven. Opened food in fridge which normally is emptied which has been the case in the last 20 homes we've rented. Pool was nice and our grand children had fun. to achieve, I take this negative review very seriously. Company to complain, they would have come over to the house immediately to solve any issues you may have had, we have been working with this professional Company now for the past 10 years and this is the first situation we have had. It has been 11 weeks now since you stayed in our home and it is only now that you have communicated. Our Management Company and myself are always at the end of the phone or emails to communicate with our house guests. I have to say that all our Domestic Appliances are under two years old and our Dishwasher was only purchased in December. We are very pleased that all your Grandchildren enjoyed our pool and Spa. I am sorry that you did not give us the chance to speak about your issues and found the need to write this review, but as anyone can see our calendar is almost fully booked for the year 2019 and a lot of re-bookers for 2020 who are very happy to re-book year to year. any prospective future guest reading this will surely look at some of our 75 five star reviews and make their own conclusion. As good as it gets in my experience. Our third holiday in this property and we enjoyed every one. It is hard to find any disadvantages of a well equipped property in an upmarket pristine gated community. Just a short ride from wonderful beaches and interesting shops including a large mall. The owners go out of their way to help you enjoy your vacation and there is local assistance should any problems arise. After 25 years of holidays in Florida we have found a real gem at Flamingo Palms. We have used this property several times over the last few years. It suits our holiday requirements down to the ground. For location, facilities and on call management It scores highly and has never let us down. We thank you for choosing Flamingo Palms for your holiday destination and hope to welcome you back again some time in the future. The house was amazing!! There were seven of us in total 2 adults and 5 kids, it was the perfect size for everyone to be comfortable. Mrs Eileen was amazing as well. Anytime I had questions she was very helpful and understanding, fast with responses as well. Every time I go to naples to vacay I will be staying at this house. I highly suggest renting this home. Its also close to everything which is a big plus. Thank you Steven for writing a review of our home...it was a pleasure to have you staying with us, so happy the children had a great time also. You know you will be made very welcome when you return again to Flamingo Palms. This was our third stay in beautiful flamingo palms. What can we say? It was as perfect and fabulous as always. The villa is superbly equipped with everything you could possibly want or need during your stay- plentiful kitchen utensils and crockery, towels and linens galore, all the outdoor pool furniture etc. It is all beautifully maintained and well thought out. Definitely has the luxury/ relaxation theme and is a warm and welcoming home. The pool/ lanai receives day long sunshine, and is the perfect place to lie and relax with a book. The pool area backs directly onto a lake, so fantastic views and you can watch the turtles swim past or clamber out to sunbathe on the lake banks right behind the villa. It’s a short drive to downtown Naples with all the amenities, great shopping and brilliant beaches. An added bonus was that we caught the summer sales so great shopping bargains to be had at Dillards in the Coastland Centre or at Miromar Outlets which is a 20 minute drive away. Cannot wait to go back- thank you Eileen and Geoff. Thank you Stephanie Keith Harvey and Sophie! It was our pleasure having you return every year to share our home', and taking the time to write this review for us, it makes all our efforts worthwhile. You have now asked to return again next year which is great to know you always choose Flamingo Palms for your holiday destination. We will try our best to makes next years stay as memorable for you all as this years. Please see our great reviews! Our villa is within 10 minutes of Olde Naples Pier and beaches. Other Activities: We have high speed internet access for our guests to use. Golf: Some of South West Florida's most prestigious clubs are in the Naples area. Beautiful public courses include Palm River, Naples Heritage, Naple Beach Hotel, Marriott at Marco, Marco Shores, Ironwood High Point, Hibiscus. These are all stunning challenging courses. All advertise club rental if required. Check with individual courses for costs and bookings.